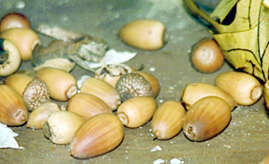 The acorn is not only a cultural food source, but it is also a symbol. As a seed... a mighty Oak tree can grow. Our values are like the acorn seed. If they are allowed to grow inside each of us, our nature and status within the tribe can be like that of the mighty Oak tree. We believe in the extended family. Aunts, uncles and an endless line of cousins not only make our family, but also make up our community as well. Friends of the family are often included in family matters. People are valued more than any material thing. Children and Elders alike are respected and useful, not to be thrown away. We believe in noninterference in other's lives and in the choices they make for themselves. Leadership is chosen through past performance. Humor, self "humiliation" is funnier than humiliating someone else. Possessions are temporary and are given freely to those in need. Security comes from having the ability to provide for the family. Patient because we live now and not in the future. Live in harmony with nature because we are part of nature. All things are created equal. Abuse of the family-- especially of elders and children.